A powerful combination of story and music: More than 100 horses were stranded on a small island for days after a heavy storm. 19 of them drowned while onlookers feared for the lives of the rest. 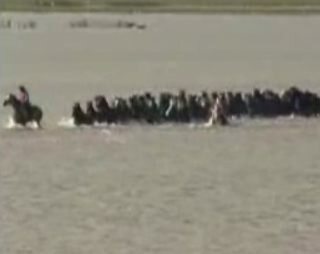 A group of women on horseback then attempted a rescue… Very moving! This was very moving. It is good to see people who care about nature will go the extra mile to protect and care for animals. Animals are a true gift to us. They need us but we need them to bring out the best in us. women who were so amazing. Bravo! This is simply beautiful and moving. Thanks so much those who made this possible. Sometimes in life we are like those stranded horses, stuck and without knowing where to go or what to do, and allowing the help and guidance of someone wiser or more capable than us we can move and release ourselves from our situation or condition. Sometimes we are in the position ofl those women and men who took action to guide someonelse out of his/her seeming imposible situation, and with caring and understanding we can do it. In the world that we are personaly involved with, we can do it! !